JeruZalem: Written and Directed by Doron and Yoav Paz; Starring Yael Grobglas, Yon Tumarkin and Danielle Jadelyn. Epic Pictures, 94 minutes. 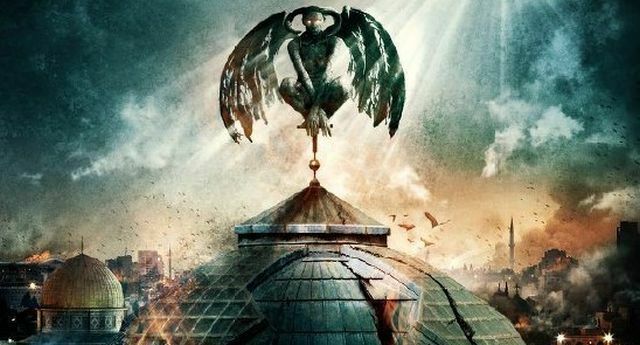 JeruZalem is a movie which pretends to be some sort of supernatural film about how demons are somehow awoken one night in the Holy City. Unfortunately, it is no more than yet another “The Blair Witch Project” rip off which goes nowhere. The Blair Witch Project was a pretty bad film itself, but at least it had an original idea: supposed actual events were filmed on a camcorder and the tape was discovered sometime later. This concept has already been knocked off a number of times in movies like “Cloverfield.” Every incarnation of the concept seems to be worse than the previous one and JeruZalem is no exception. And as in each of those movies, the gimmick gets annoying after the first 20 minutes. This time two girls travel to Israel and one documents everything that they experience with Google glass; even though, no one anywhere actually uses any such device. What a stupid, horrible and pointless movie. It opens with a flashback scene to more than 40 years ago when a Rabbi, a Priest and an Iman come together to deal with some sort of demonic possession. The event only effects this one woman and is somehow forgotten for the next 4 decades. When the demons do come back we are given no warning about it and absolutely no explanation as to why. In the movie’s first 45 minutes we are treated to scenes of these two young girls arriving at Ben-Gurion International Airport, riding to Jerusalem and finding a place to stay in the Old City. They settle on some sort of old hotel in the Muslim Quarter. After a night of partying the end of the world arrives, or did it. We then get a bunch of typical horror shlock sceneswhere a small group of people try to survive while attempting to escape the danger as they are picked off one at a time. And who are the bad guys in this movie: flying zombies. They are actually supposed to be some sort of demon but they look just like zombies, they eat people and one bite or scratch turns the victim into one of them. We are also treated to some sneak peeks at some sort of giant monster ala Cloverfield. All the while the Israeli military keeps shooting at the monster after it closed the Old City off preventing the people within from escaping and spreading the whatever it is. Joke’s on the IDF since these zombies can just fly over the Old City walls. So what exactly is happening and why did it happen? Were these demons? If so, what awoke them? What exactly is going on here? We do not know because they did not tell us. There was no obligatory scene where our heroes come upon someone who explains it all; let’s say a priest who knows exactly what is happening and why. Ordinarily, this would be frustrating, but I just didn’t care. Neither will you. That is if you fail to heed my warning and avoid seeing this movie. On the bright side, as our illustrious editor has pointed out, there are a lot of nice scenes of Israel in the movie. So what?